Alexandra Bullen Coutts | YA Author. 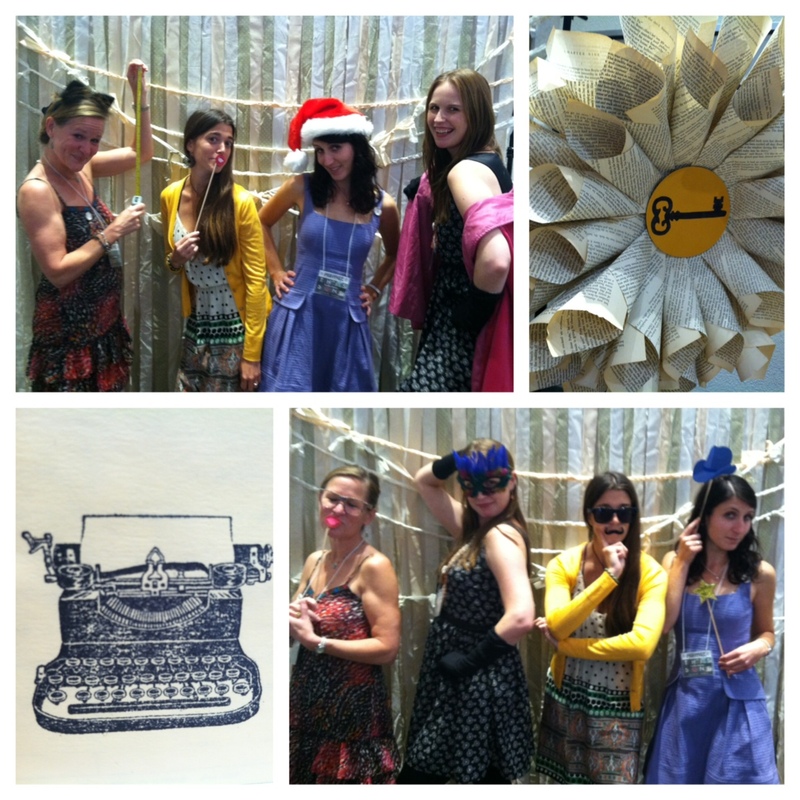 I can’t say enough about how much I enjoyed spending time with the Fierce Reads crew. Fellow authors Marissa Meyer, Leila Sales and S.A. Bodeen, and Macmillan publicists Molly and Mary were all an absolute delight to get to know. Before I left, I didn’t give much though to how much time we would all be spending together — not just time, but intense time, like 6 am drives to the airport time, or after-midnight hotel check-in time — and let’s just say, under different circumstances, things could have gotten tricky, once or twice. But these ladies were all so easy to be around, and the trip was planned so meticulously (without feeling inflexible or suffocating) that there was never even a moment of discomfort. From the events to the travel to the downtime (not much, but we managed to get in a few quality meals!) every day was pleasant and exciting. I feel so very lucky to have been a part of it. I’d love to post more about the individual bookstores and events (there were many, and they were all so welcoming and impressive) but for now, I just wanted to thank the people at Macmillan for putting together such a fabulous tour. And, of course, a big thanks to everyone who was able to come and say hello! Writing books can be a lot of lonely work, and it’s nice to be reminded that on the other side are so many thoughtful, intelligent readers. I loved meeting each and every one. 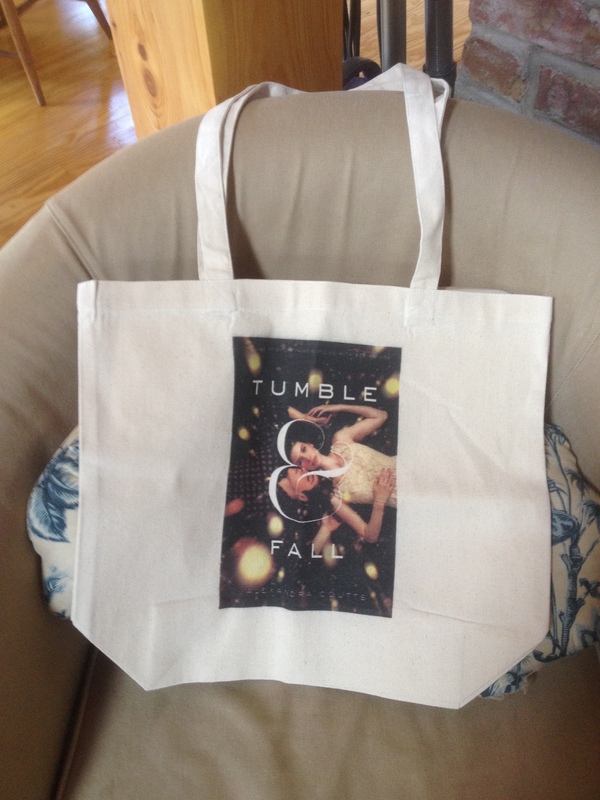 Tumble & Fall Tour Giveaway! I have so much to report on the #tumbleandfall challenge, but considering the amount of packing (and freaking out about packing) I have left to do, that will have to wait. Aren’t they great? There’s even a nice little quote on the back. And the REALLY exciting news is that I’ll be bringing a bunch of these with me on tour! I’ll have one to give out at each stop, to one lucky audience member. Every morning, I’m going to tweet out a question (or prompt, or something…haven’t quite worked out the details) and the first person to answer at the event that night, gets a bag! So be sure to follow me on Twitter if you’re planning on making it to one of the tour events this week. Hope to see you there! Happy Birthday, TUMBLE & FALL! It’s official! TUMBLE & FALL is available for purchase today, anywhere books are sold! I am so happy and excited to share this book with you all. So many people have worked so hard to bring it into book-being. Many, many thanks to the folks at Alloy Entertainment, and FSG (especially the Fierce Reads crew!) It has been an honor to work with so many smart, dedicated and fun people. I feel lucky every day to have this job, but today I’m feeling extra grateful. Thank you, thank you, all. 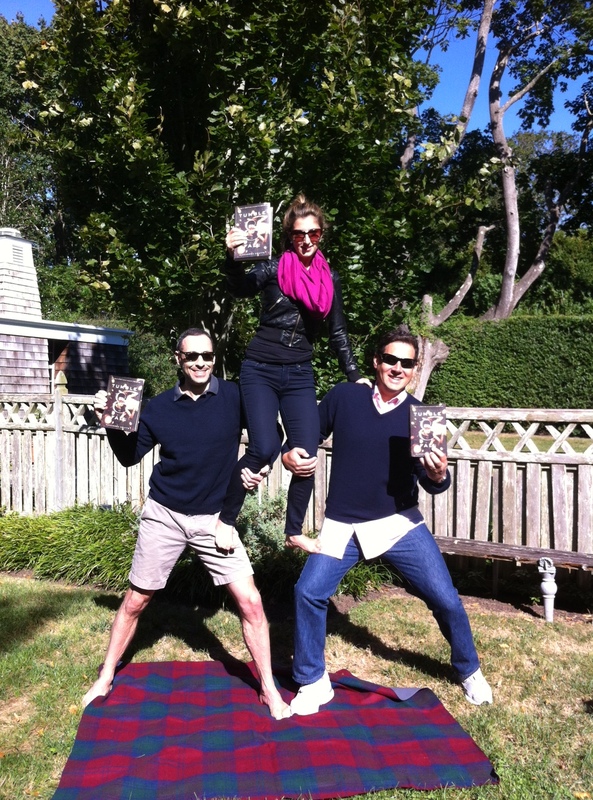 A few of my editors at Alloy, currently on their company retreat, just sent over this hilarious photo. It was on their #tumbleandfall challenge list to create a human pyramid…and…I guess this counts? First things first: TUMBLE & FALL is out next week! It seems insane that after all of this waiting and tweeting and talking about that far-away day in September, we are now less than a week away from pub day. I’m getting so anxious and excited (and anxious) to share this book-baby with all of you, and even more anxious and excited (and anxious) to head out on tour soon after! If you’d like, you can still pre-order the book on Powell’s. And don’t forget to ask for it at your local bookstore! Now, on to Challenge business. Some exciting news! The good people at Macmillan/FSG have picked up the Challenge torch by starting a contest on Twitter! All you have to do is send out a quick tweet, telling us what’s on YOUR challenge list, add the #tumbleandfall hashtag, and you’ll be automatically entered to win a whole bunch of great prizes. More details here. As for my Challenge progress…I’ve decided I’m going to give myself a little wiggle-room on one particular challenge, and consider it met, although, technically speaking, it’s still a work-in-progress. 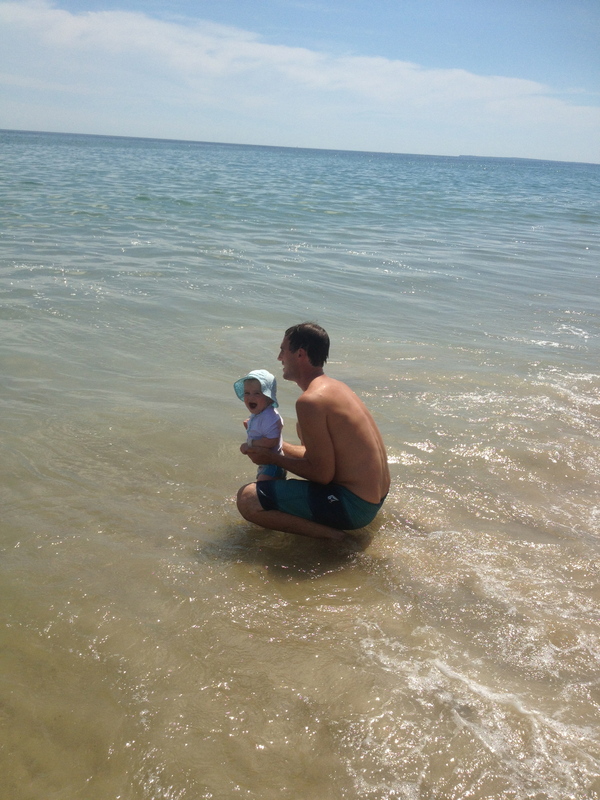 This would be Challenge #6: Teach Evie To Swim. These two are a pretty amazing seaside pair. 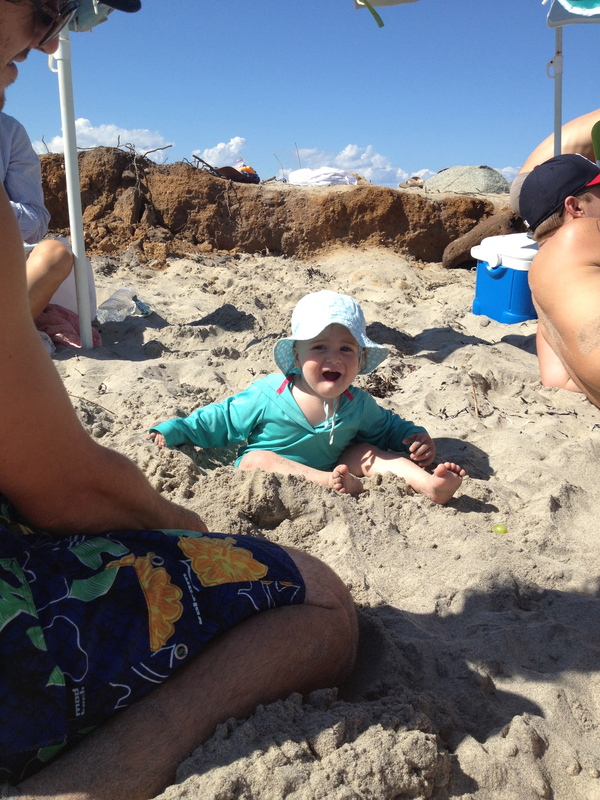 And it must be said that while Evie tolerates playing in the water, playing in the sand is really where she shines. 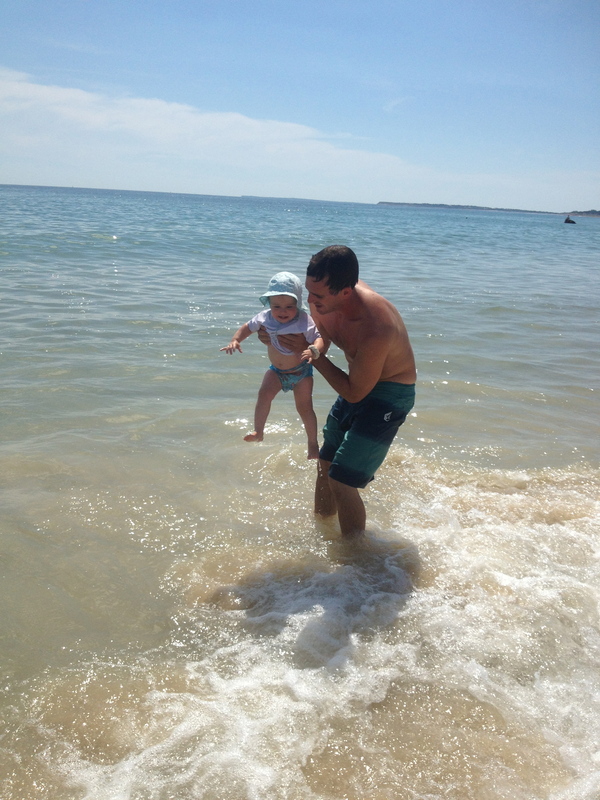 These quick glimpses of summer were just what the doctor ordered on a dreary Friday (the 13th!) Here’s hoping the sun comes out this weekend, wherever you are. Before I get on to more Challenge Updates, I have some very exciting news to share: In just a few weeks, I’ll be heading out on my very first book tour! Along with a bunch of other amazing Fierce Reads authors, I’ll be hopping around the country, visiting with bookstores and readers and one very cool-looking Teen Book Festival. Check out the details here. I. Can’t. Wait. The past few weeks have been bittersweet. 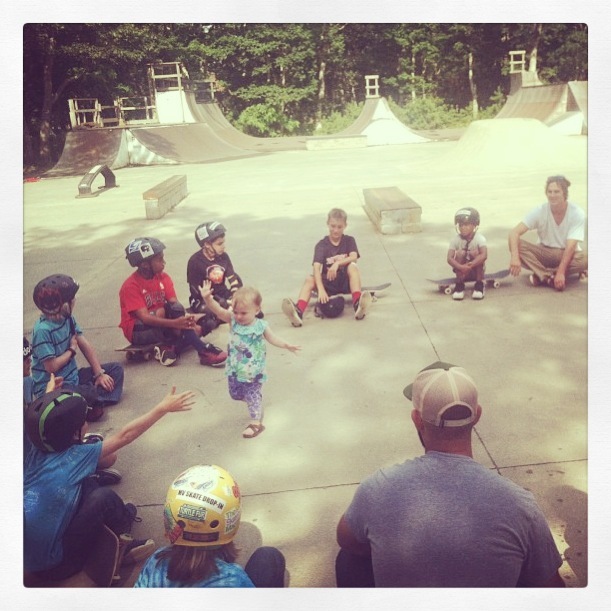 We’ve been super busy, wrapping up skate camp and hosting many, many visitors. It’s been such an incredible summer, and it’s sad to think it’s coming to an end. Living where I do, I always have a hard time saying goodbye to the summer season and all it brings — long beach days, gatherings with friends, our amazing county fair! — but I have to say that this summer with Evie has been, by far, the best one yet. Last weekend, a bunch of my best college friends and their plus ones came to visit, as part of Challenge #4: Host a College Reunion. Despite some decidedly unseasonable weather, we had a blast. Lobster rolls and steamers in Menemsha, lazy beach mornings, trips to the West Tisbury Farmers Market, and lots of silly, late night fun after the babies were in bed. It was so amazing just to have them all here together, but I knew I wanted to do something extra special to mark the occasion. 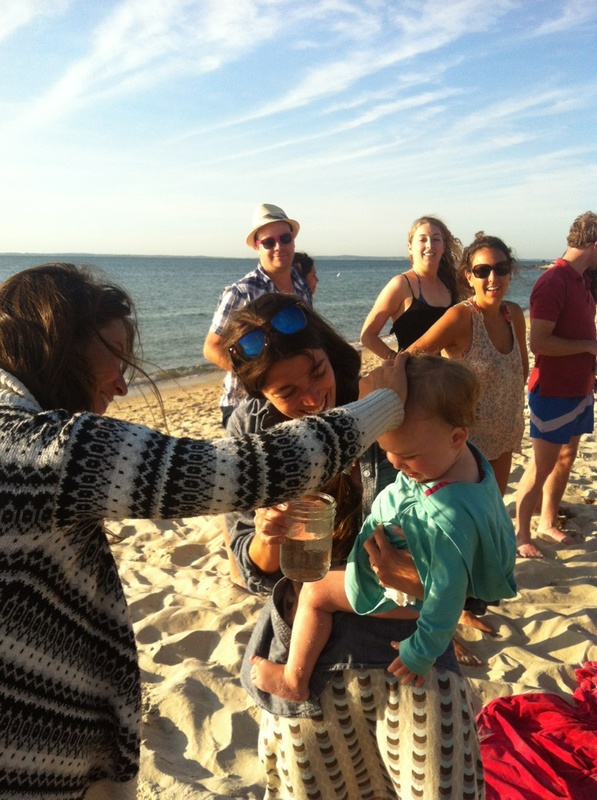 We had also been talking about having a small, non-religious “welcoming” ceremony for Evie on the beach, and this weekend felt like the perfect time. We invited a bunch of friends to our favorite beach one evening, and asked a few people to write special blessings to help bring Evie into our wonderful Island community. 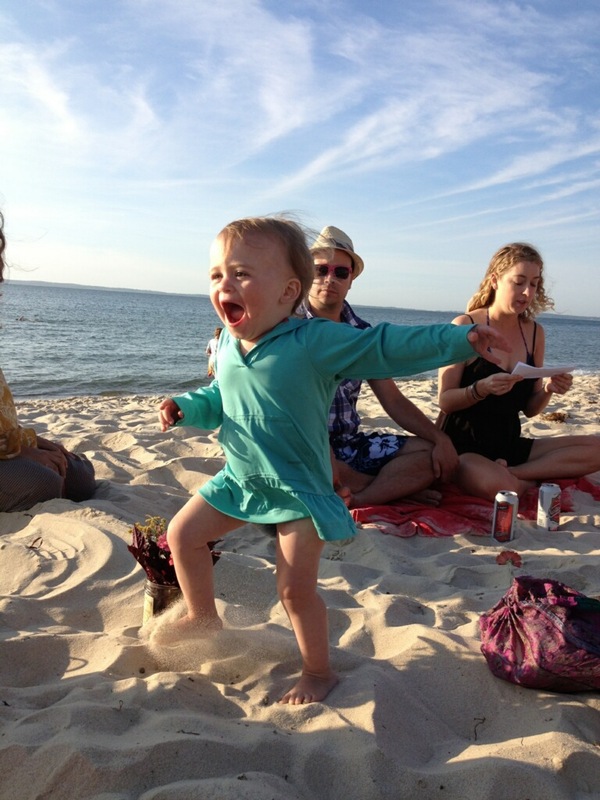 We sprinkled her with ocean water and she ran around like a giggling lunatic (as usual.) It was absolutely perfect, and felt like the ideal way to celebrate having so many close friends with us on a beautiful, end-of-summer Sunday. I know (or I hope) that there’s not really an asteroid threatening our planet any time soon, but I do think that setting these Tumble & Fall-inspired goals for myself has truly made me appreciate beautiful moments like this one all the more. Hope you’ve been making some special memories of your own this summer. I know, I missed a week. I’d like to say I have a list of worthy excuses, but I don’t really. I’m going to chalk it up to that mid-challenge slump and look ahead to a new month of kicking some serious bucket-list booty. 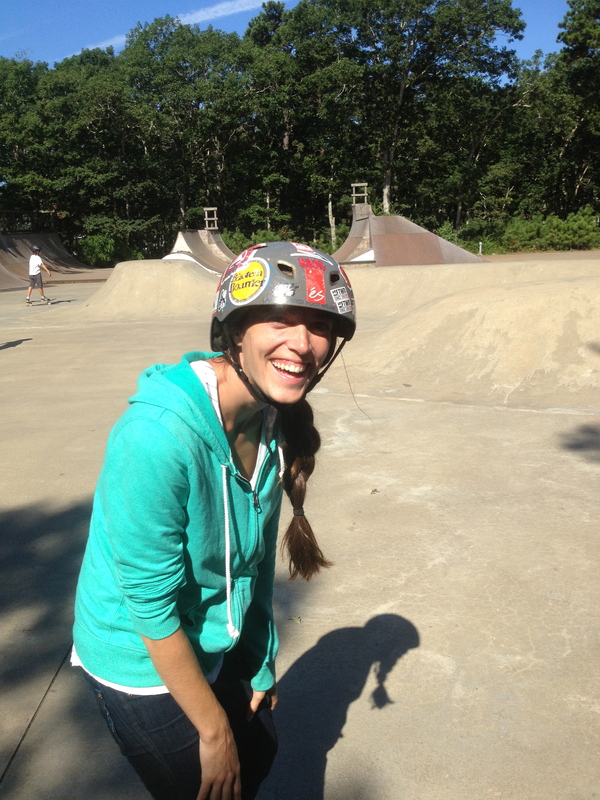 This week, I had my second skateboarding lesson! I have been putting these off for a variety of dumb reasons, mostly involving footwear. In these photos, I’m wearing my flimsy (but cute!) old sneakers, but right after this lesson I purchased a new pair of neon yellow Converse low-tops, so from this day forward I’ll be skating in style. It may look like I’m standing still, but I’m moving. I swear. Young love. Can’t beat it. In other challenge news, I’ve been making some good progress on a short play I’m writing (#4). It’s only a 10-pager, but it feels good to be writing straight dialogue again. Next week, I’m finally going to take a dance class (#7) and next weekend, my three best college friends and their partners/kids are coming for an impromptu reunion (#9)! Elsewhere, I got some exciting news from the publicity crew at FSG. The final final Tumble & Fall hardcovers are in, and I cannot WAIT to hold one! Here’s the pic I saw on twitter. So shiny!!! Here’s to a busy next week in Challenge land. I’m hoping my new kicks will help. Tumble & Fall Challenge: Week Four! Well, they’re not all going to be big weeks. I don’t know if it was all of the visitors we’ve been having, or the fact that Evie got some weird mystery illness (on top of the four enormous molars she’s been pushing through for weeks) or just a to-be-expected mid-challenge slump, but not a whole lot has happened around here since last I checked in. Which is not to say the week was a total bust. We DID have our first official date night last night (though the pictures we took are too dark and terrible for posting.) We had a late dinner at a restaurant we love called The Red Cat in Oak Bluffs, and then went to hear Maceo Parker, funk master and showman extraordinaire, play at Flatbreads. The show was incredible. Maceo Parker plays saxophone and was in James Brown’s band, and later played with everyone from Prince to De La Soul to Dave Matthews. He is such an incredible performer. I definitely recommend checking him out if you get the chance! But the highlight of the night had to be when one of his backup singers came out to do a hilarious, growly rendition of one of my very favorites, Stand By Me. (“If the sky that we look upon should tumble and fall…” Sound familiar?) I found a video from a festival they played in France a few weeks ago, if you’d like to take a look. I especially love at the end when she sings to Maceo and he looks one part thrilled, one part terrified. In skateboarding news, I managed to go a full week without so much a setting foot on a board. But camp was busy! I can’t tell you how much I love watching these kids grow over the course of a week, not just in skills but also in confidence and in their relationships with the counselors and other campers. It’s just the best. And Evie can’t get enough. Her favorite part of the day is definitely morning stretches, when she walks around the circle, climbing all over everyone’s legs and getting right in their faces to ask for high-fives. 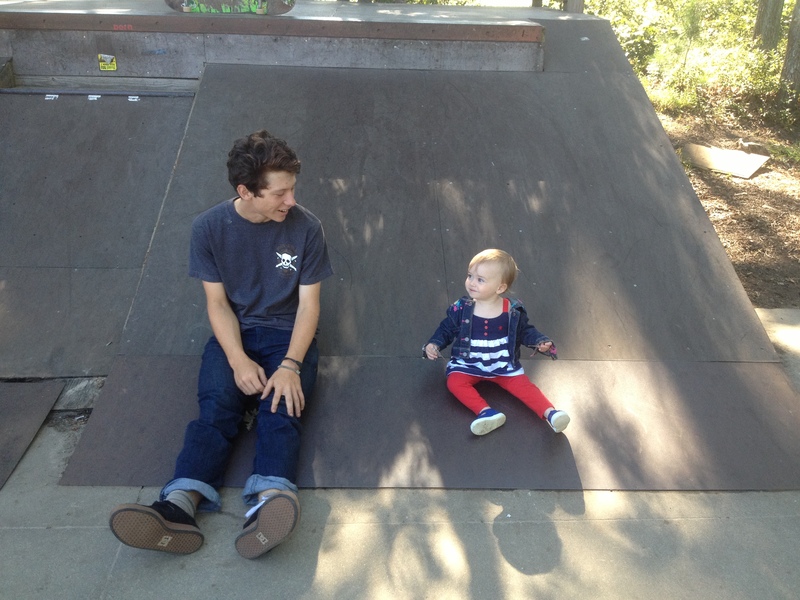 Finally, I think by way of inspiration, Eliot showed me a skate video this morning that totally blew my mind. Skip ahead to the 6:30 minute mark if you’re short on time and want to get to the face-melting, stat. (Hint: there’s a helicopter involved.) What is wrong with this dude? And also, I love him. That’s it for this week! Hope you all were a little bit more productive with your goals. I’ve got big plans for next week. Stay tuned! Tumble & Fall Challenge: Week Three! But there’s something about getting away, even if just for a few days, that feels sort of important and classically “summer”, and I want to make sure Evie has that experience from a young age. 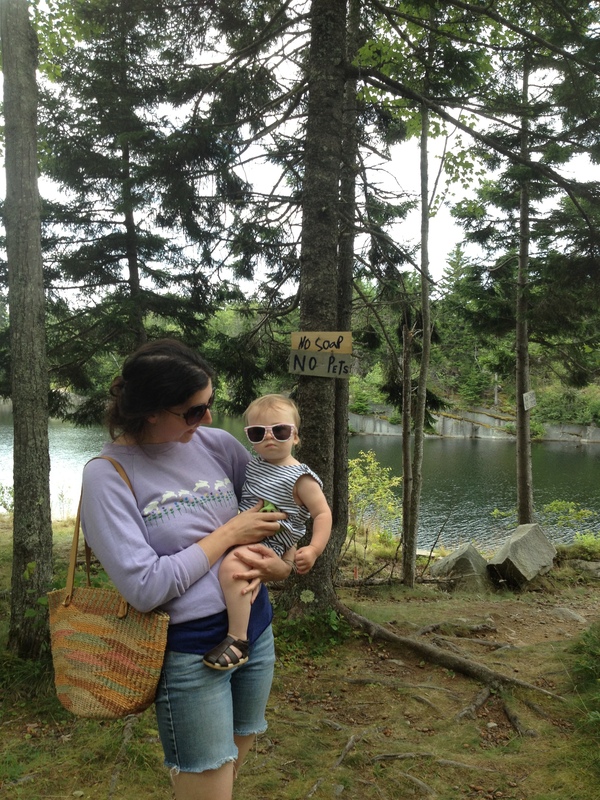 So, this year, we decided to go up to Maine, to visit friends on another magical island, called Vinal Haven. I posted a few shots on Instagram, but here are some extras. We had such an incredible time! Here’s Evie in the front yard of our friends’ house. 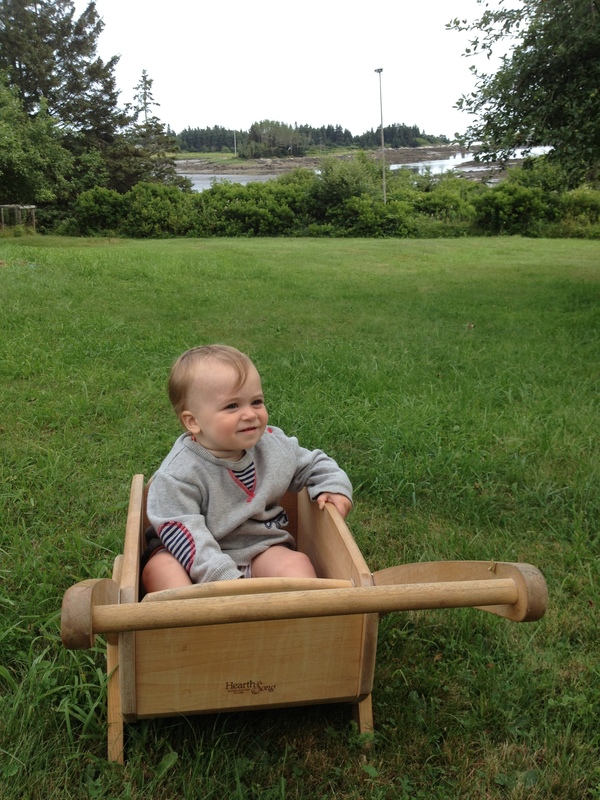 (Isn’t this wheelbarrow adorable?) The island has all kinds of inlets and the house overlooks one. It was such a quiet, peaceful spot. Here’s Evie with our friend, Jenna, who took the trip with us from Boston. (She was a lifesaver on the long drive and endured many rounds of “Wheels on the Bus” and Bob Marley lullabies on repeat.) This is one of Vinal Haven’s many quarries, basically a giant hole where granite was dug up (and in some cases, apparently, used to build the Brooklyn Bridge!) The holes eventually fill with rainwater and become these incredibly refreshing swimming spots. Evie cracks me up in this photo, she looks like a bouncer at a club. I also love the “No soap, No Pets” sign in the background. I can see how it would be tempting to make this place your own, personal tub. 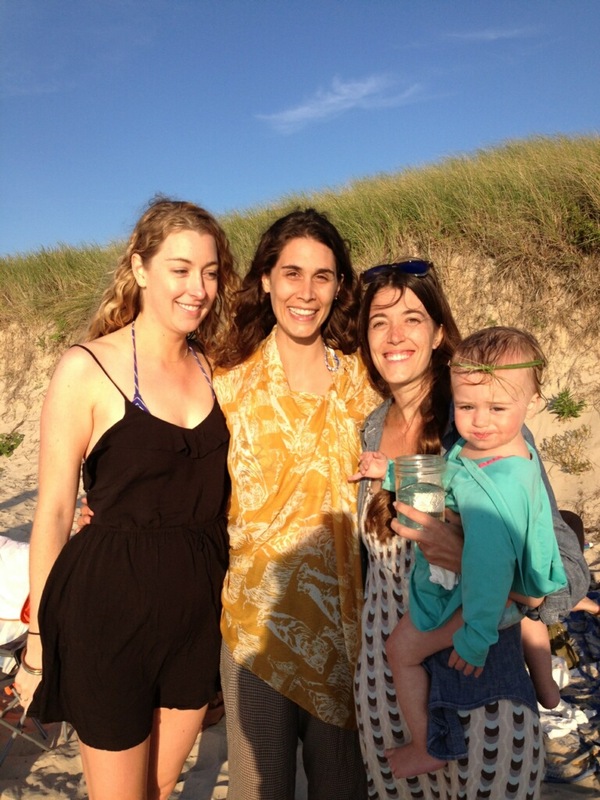 And here we are with Courtney and her little (big!) guy, Brady. This was before she decided to give him a haircut on the front porch! He looked even cuter, afterwards, if you can imagine. All in all, it was such a great trip. Just what we needed, and the best part is it feels like a tradition we’ll be happy to keep. How is everyone doing out there? Any summer vacations lined up? Tumble & Fall Challenge: Week Two! It was a big week in Challenge land! Despite (or maybe because of) a serious heatwave here on the island, I was able to get to work on a few of my bigger goals. I even crossed one off the list completely! #2. 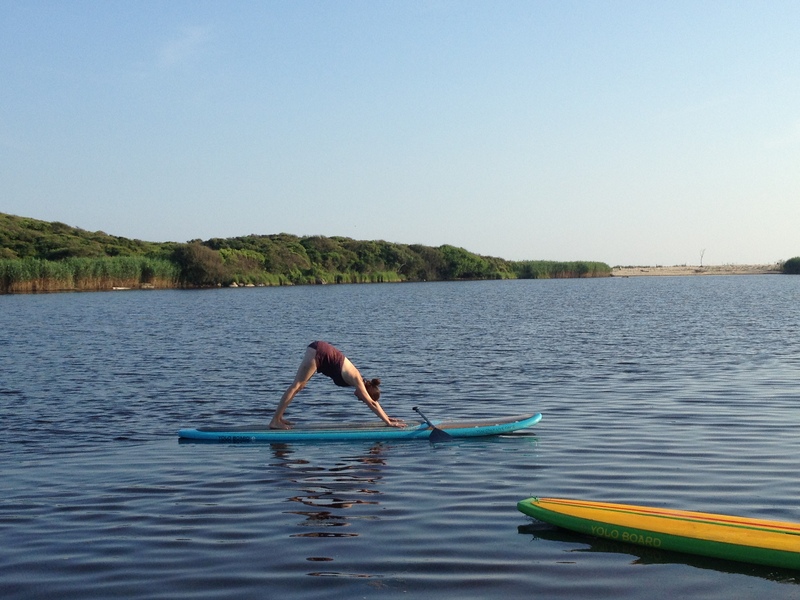 Take A Paddle Board Lesson. Have you guys tried this? It’s sort of a cross between surfing and canoeing. You stand on a big, foam surfboard and paddle around, and it’s insanely fun. 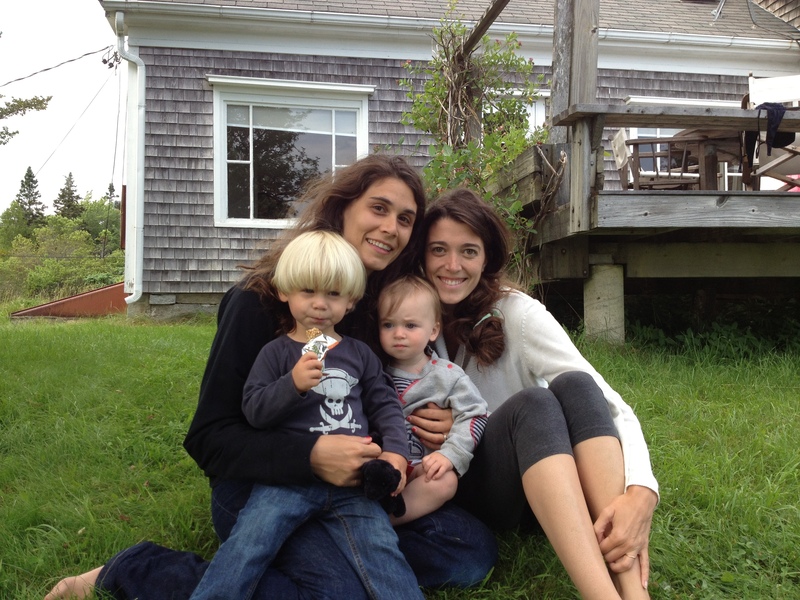 A great friend of mine, Kaila, lives on a beautiful farm in Chilmark, across the road from a pond and beyond it, one of the Island’s most gorgeous beaches. 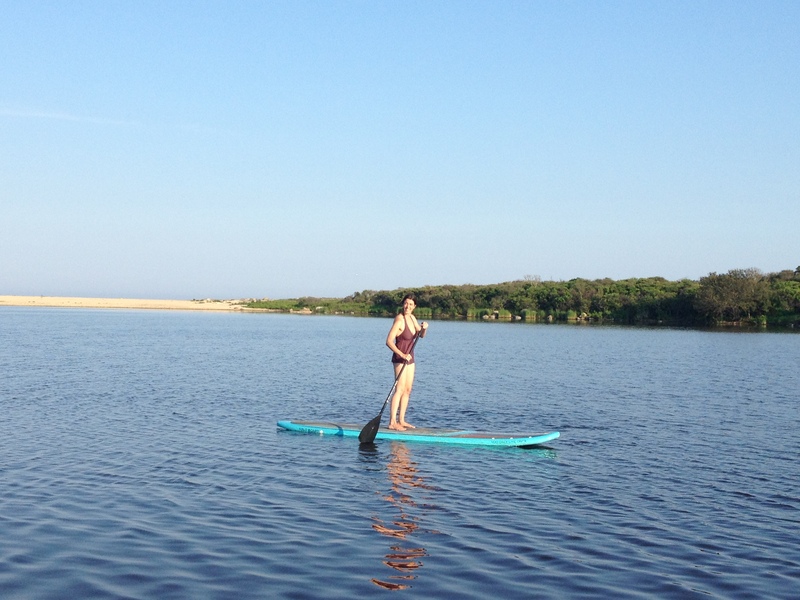 She also happens to be an expert paddle boarder, and she offered to take me out for a lesson yesterday afternoon. It was almost evening, and the light on the pond was turning dusky orange. Sometimes I really can’t believe how lucky we are to call this place home. 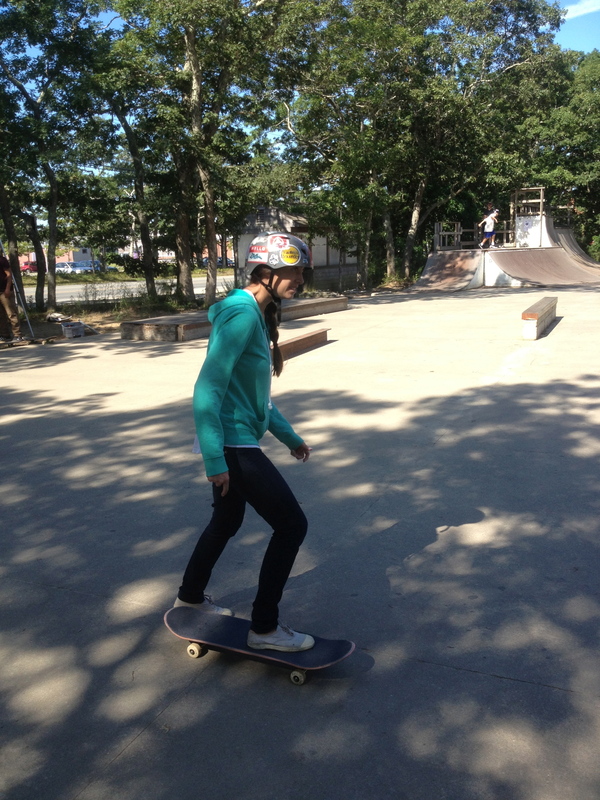 Here I am getting comfortable (almost) on the board. It wasn’t as hard as I thought it would be, though I can see how it’s a great workout if you do it for a while. 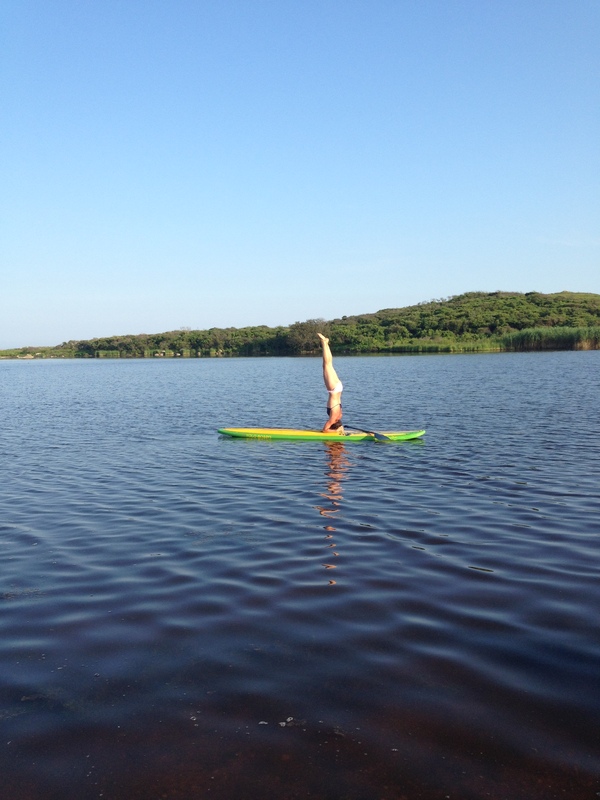 It takes some serious abdominal strength to work the paddle and not fall over. 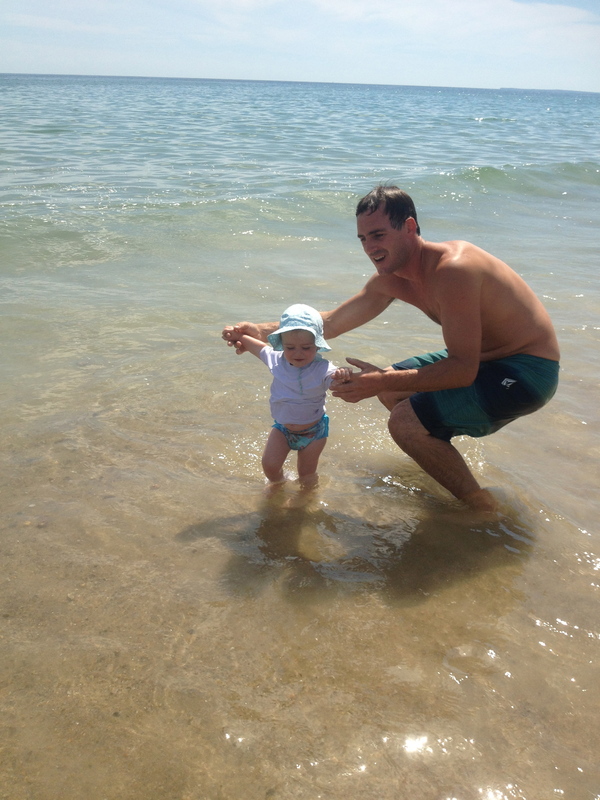 But it’s such a cool way to cross the pond and say, go for a quick jump in the ocean, which we happily did. Then, to inspire me for next time, she showed off her headstand. I have no idea how she did this. I can hardly do a headstand on solid ground, these days. I guess the point is, I’m already hoping there will be a next time, which is the sign of a good lesson I’d say. Thanks, Kaila! This was definitely my favorite challenge, so far. Also this week, we got started on our little garden project. It’s already so late in the season that sometimes I’m tempted to just save this for next year, but that’s the thing about the T&F challenge! Just because I can put something off, doesn’t mean I should. 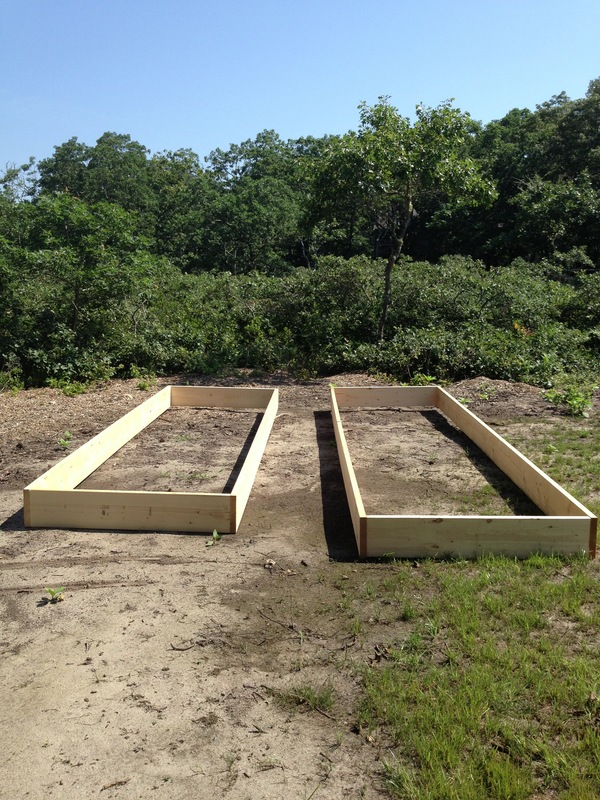 So last weekend, we chose a spot for our garden and decided to build two raised beds. And that’s all for this week! I’m posting on Thursday because tomorrow we’ll be traveling! #5 on my list was Take A Family Vacation, and so we’re off to Maine to visit my bestest friend Courtney and her family for a few days. They have a house on a teeny tiny island (smaller than this one!) and I’ve been hearing magical things about it for years. Can’t wait to finally see it and watch our littles play together in the sun. Hope you’re all having excellent summers, staying cool, and maybe even checking off a few challenges of your own!